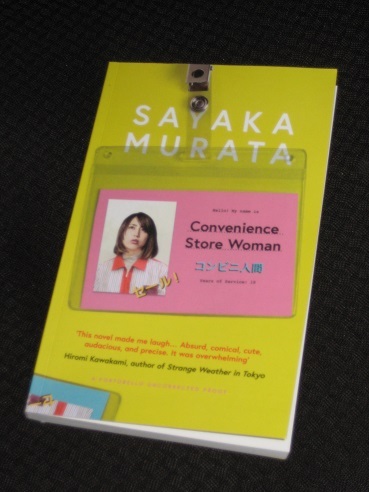 Sayaka Murata’s Convenience Store Woman (translated by Ginny Tapley Takemori, review copy courtesy of the publisher) is a short, quirky novel focusing on the woman of the title, Keiko Furukura. Having found sanctuary in one of Japan’s ubiquitous convenience stores after graduating from university, she has managed to stay there ever since, avoiding having to deal with a world that she doesn’t understand (and certainly doesn’t understand her). After eighteen years in the business, she has adapted her daily routine to the rhythm of the store, and she wants nothing more than to continue in her job indefinitely. Anyone with more than a passing interest in Japanese culture and society will know that standing out isn’t the done thing, and Convenience Store Woman takes this idea to the next level by telling the tale of a woman who not only doesn’t want to fit in but wouldn’t have a clue how to. Keiko is not your typical thirty-something (in fact, it’s tempting to say she’s not your neurotypical thirty-something), and there are several instances in the story of her struggles to understand and empathise with the people around her. One example comes from her childhood, in the form of an anecdote of her hitting two boys with a spade as it’s the best way she can think of to stop them fighting. It’s easy to see how she feels comforted by a familiar environment, having never belonged in the outside world, with manageable differences within a structured framework allowing her to get a grip on life. The sympathy we find for her is occasionally tried in this manner by the realisation that she really is different to most people. The crux of the story is her decision to get her friends and family off her back by hooking up, on the surface, at least, with the pathetic Shiraha, a man who struggles just as much with society as she does, if for different reasons. Lazy and deluded, he believes that the world has it in for him, and his idea of a sanctuary is anywhere where food and board are provided, leaving him to think big and build his castles in the air. He’s far from an attractive character, in body and personality, but Keiko sees him as a way to compromise between her needs and the demands of the world, a necessary evil in her little world. Convenience Store Woman is Murata’s first full-length work in English (her story ‘A Clean Marriage’ was included in Granta 127: Japan), and there’s lots to enjoy about it. We are treated to the daily and seasonal rhythm of the convenience store, including the influence of the weather on sales, and on customer behaviour. Of course, the main drawcard is Keiko herself, with Tapley Takemori providing an excellent voice for Murata’s detailed creation. The writer shows us how the convenience-store worker takes her cues from the world around her, imitating the speech patterns of her coworkers, not to mention their clothes and style ideas, in an attempt to stand out just a little less. Really enjoyed Hiromi Kawakami’s titles and this sounds like it has a similar deadpan, quirky feel. Great review Tony – certainly piqued my interest.